LABOUR MEP EMER Costello has said her former colleague and now constituency rival, Nessa Childers, “a little bit in a political abyss” in the European Parliament as a result of her having left the party. Costello will face stiff competition from Childers to retain her seat in three-seat Dublin in the 23 May European elections with the now independent Childers, who left Labour last year, switching to Dublin in the wake of her Ireland East constituency being abolished. 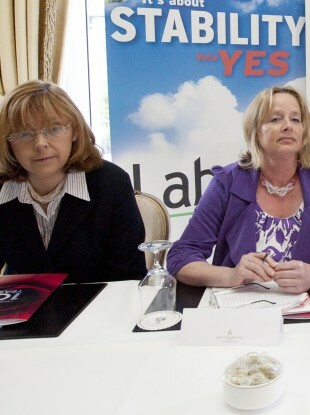 Speaking to Karen Coleman on RadioEP.ie earlier today, Costello said that although Childers is “free to stand wherever she pleases” she will face a challenge in having to move constituency and having previously been a member of the Green Party as well as Labour. She also claimed that Childers’ decision to leave Labour has left her outside of any of the major groupings in the European Parliament, adding that non-aligned members are not a cohesive group in the same way as the Dáil’s Technical Group. “When you look at the composition, how could there be? Because you have people like Godfrey Bloom, who is kind of famous for his ‘bonga bonga’ comments and is no longer in UKIP. She said that unlike other independents such as Ireland North-West’s Marian Harkin, who is aligned to the ALDE grouping, Childers is outside any cohesive grouping. “Here, unfortunately, the reality is that if you are not aligned to a political group you really are a little bit in a political abyss,” she added. Email “Emer Costello says former colleague Nessa Childers is in 'a political abyss'”. Feedback on “Emer Costello says former colleague Nessa Childers is in 'a political abyss'”.